Increased Sympathetic Activity – The Core Cause of PCOS? What causes PCOS and why acupuncture is effective at restoring ovulation and regulating cycles has puzzled specialists, endocrinologists and gynaecologists for decades. The “bible” on the treatment of infertility (Clinical Gynecologic Endocrinology and Infertility) says “The characteristic of polycystic ovary develops when a chronic anovulatory state persists for a sufficient length of time.” But there are many causes for anovulation. A recent study published in the Nature magazine could change how we see PCOS. Swedish researchers, who conducted the study, discovered that sympathetic nervous system is hyperactive in PCOS women. And most noteworthy, the sympathetic hyperactivity precedes anovulation. Hence this could potentially be the underlying cause of PCOS. This phenomenon could explain why acupuncture can reverse some of the of the harm done by the syndrome, including restoring regular ovulation, decreasing androgen levels, regulating ovarian blood flow and the function of HPG axis. The excess levels of “male hormones” – androgens. This is the central feature of PCOS. Female to male transexuals consume anrdogens to develop male features. This excess androgen levels can result in PCOS. Hyperinsulinemia and insulin resistance – excess insulin levels in your blood increase the risk of PCOS. 25-50% of women with PCOS have no insulin resistance. Among women with insulin resistance, the incidence of PCOS is low. Nonetheless, these are the key factors and are cause of hyperandrogenism in some women. Both increased androgens and hyperinsulinemia very likely are playing a role in causing PCOS. However, increased sympathetic activity may be preceding these changes. Hyperandrogenism results mostly from excess androgen production in the ovaries. Elevated androgen levels. The excess androgen is mostly produced by ovaries. The common signs are hirsutism (excessive hair), acne, hair loss. 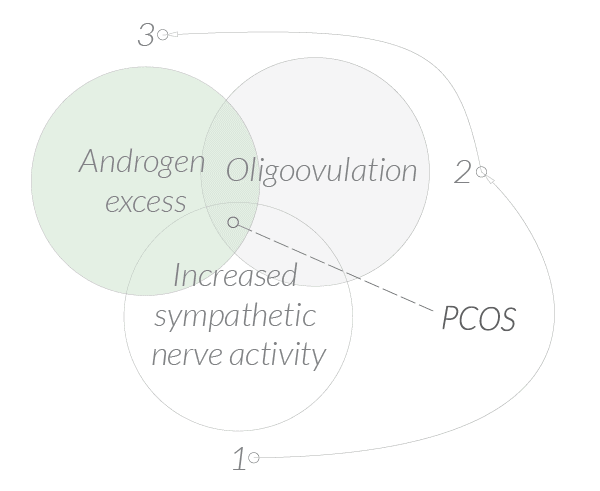 Androgens affect the ovaries and pituitary ovarian axis. Central obesity is not an essential feature of PCOS. It adds to pathophysiology by aggravating insulin resistance and hyperinsulinemia. You don’t need to have all of above symptoms to be diagnosed with PCOS. Some women are lean, some experience weight gain. Blood tests: increased testosterone, raised Luteinising hormone level and reversed follicular stimulating hormone/luteinising hormone ratio. It is important to diagnose and address PCOS early on, so that you can minimise any further damage to your health. Acupuncture has been shown to benefit PCOS in numerous studies. It seems to be especially effective with women who do not have significant weight gain. However, even patients with high body mass index will benefit from acupuncture, it just takes a little longer. Current pharmaceutical treatment options are symptom oriented and, although effective, can have severe metabolic and gastrointestinal side effects. Treatment of infertility will often result in multiple pregnancies. Lifestyle changes include low GI diet and exercise. We’re happy to discuss your lifestyle during your initial consultation. When done correctly, acupuncture can restore normal ovulation, decrease ovarian cysts and ovarian size in PCOS patients. More studies are needed to fully understand the effect of acupuncture on PCOS. Will acupuncture help in your situation? Contact us to discuss if we can help in your situation. We’re often busy with patients, but we try to answer as soon as we can! Contact us! Are you interested to learn more? Check out our research project: studies on acupuncture and PCOS. PCOS and Fertility acupuncture is our expertise. Contact us now to discuss how we can help you.